With the release of the Dungeons and Dragons 5th Edition Starter Kit and Player's Handbook, I have decided to convert my long languishing adventure "The Coming Dark" to 5E. But, unlike other publishers who will remain nameless, I am not going to rush it out there, and no one's going to see a thing about it until (1) the licensing options are given, and (2) the Dungeon Master's Guide is released. That being said, I have started to try and figure out how 5th Edition works in terms of creating adventures. In 4E, creating balanced encounters was rather simple because everything was equally balanced - given an equal level, five monsters were an even match to five PCs - but that's not exactly the case any more. Now it's more like 3.5E and earlier versions, where a monster's difficulty is reflected in an obscure "Challenge Level" which is extremely hard to calculate. I mean, after you stat up a monster how do you know what CR Challenge Level to give it? That led me to wonder about balance in general, specifically how balance is determined. 5th Edition had an unprecedented amount of playtesters, so they had access to a variety of groups that could test and retest things in the hopes that they could determine what is balanced and what is unbalanced. But there's an inherent problem with that: not every group is the same, and not every player is the same. If an exploit exists, it will take a small handful of "high end" players to find it... so if something is taken advantage of by so few, is it really a balance issue? Can the game be unbalanced by something you're not even aware of? So I thought about how some things could be experimented with... and the programmer in me realized that this is no different than load testing an application. When you do that, you don't run it a few times and see what happens. You run it a LOT of times and get the average results. So I decided to create a simulator. In the first scene of "The Coming Dark", the players are set upon by a large group of skeletons. But how many is enough? At what point does the encounter go from being a cake walk to a crushing defeat? So I wrote a program to simulate 50,000 combats between two groups: the five pre-generated characters that are included in the Dungeons and Dragons 5th Edition Starter Kit versus an indeterminate amount of skeletons. How many skeletons does it take before the players are likely to be on the losing end of the battle? All the attacks are basic attacks. Every class uses its preferred melee attack except the rogue (which uses his shortbow) and the wizard (which uses the cantrip ray of frost). The noble fighter and cleric are the "preferred" enemies of the attacking skeletons. These are the front line defenders, and likely the ones that stand between the skeleton and the wizards. Only when they both fall is the rest of the party at risk. No high end magic of any kind. Needless to say this would quickly sway the encounter in the player's favor. No healing. No action surge, no cleric healing, no potions, etc... again, this is something the players have that the skeleton's don't. This also means that the players will not use any limited resources during the combat. No one gets advantage or disadvantage on any roll. For that reason, the rogue never deals additional sneak attack damage. A natural 20 deals double the normal damage. I know this isn't precise, but it's easier to code. All the damage is rolled; no averages are used. The skeletons have an AC of 12 and 6 hit points each. They have a shortsword as a weapon, which gives them a +3 to the attack roll and deals 1d6+1 damage on a hit. The PCs are the five defined in the starter kit: Noble Fighter (greatsword), Folk Hero Fighter (bow), Cleric (morningstar), Rogue (shortbow), and Wizard (ray of frost). Since he deals bludgeoning damage and the skeletons are vulnerable to it, the cleric deals an additional die of damage on a hit. Again, not precise... but easier to code. I ran 50,000 iterations of each combat, adjusting the number of skeletons from 6 to 12. The simulations yielded the following. So, in a nutshell, the 11th skeleton is quite the badass. Players could more or less handle ten of them, but when that 11th one steps in things go to crap pretty quickly. So what did we learn from this exercise? It's very possible for PCs to trash a modest amount of low end minions without having to fire their big guns. The above doesn't use healing at all, which means that even if the PCs get dinged about a bit they are still able to recover. PCs can win an encounter with 8 skeletons over 80% of the time and immediately go into the next encounter. Dailies, spells, healing potions and other consumables - things that the monsters generally don't have - tip the scales considerably in favor of the PCs. If you walk into a room with 6 skeletons in it, you can probably dispatch them fairly easily. As glorious as it might be, you don't have to nuke the whole room. Until more concrete guidelines for monster creation and encounter balancing come about, I'll keep using this simulator and try to get a feel for how things should be. Over time, I might improve the simulator more and more so that it's more representative of each PCs actions in an encounter. Who knows? Maybe this will end up being a full on AI framework? I can't help but wonder if WotC does this sort of analysis. Like I said above, sure they have tens of thousands of playtesters but it's such a diverse group with so many different situations that it may be hard to quantify. Not to mention that, if you present a specific combat situation to two separate groups, 99% of the time you'll get two different approaches and two different outcomes. 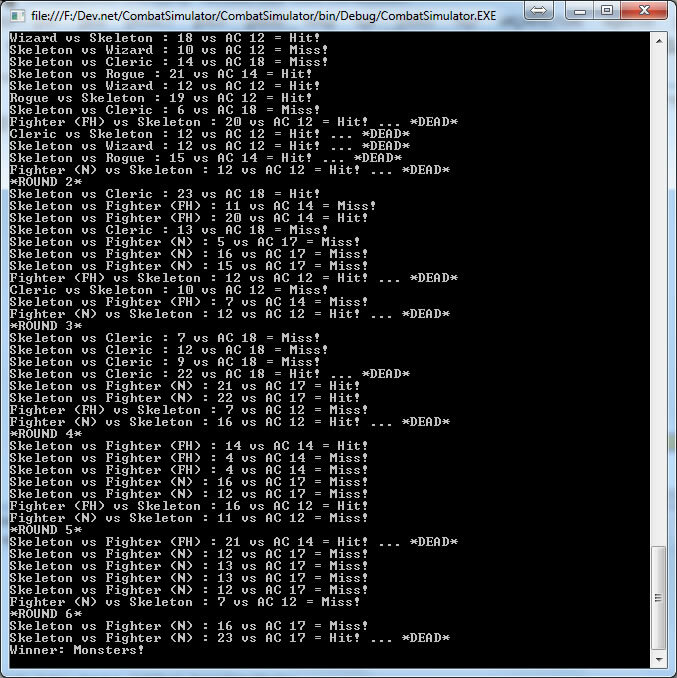 If you're curious, you can view the C# source code for the simulator HERE. Recently I was introduced to 13th Age via a Google Hangout play session hosted by Aaron R. (@WolfSamurai on Twitter). You can read more about him and his campaign HERE on Obsidian Portal. If I was only allowed to say one thing about 13th Age is that the ruleset has the amazing ability to win over players and DMs alike in just one session. And I'm not the only one that is fascinated by the product; I've been seeing several people moving away from traditional D&D and Pathfinder towards 13th Age. Heck, even Sersa at SVD Press released a PDF of conversion notes for Crucible of the Gods. So minutes after I participated in that gaming session, I ran to the Pelgrane Press website and bought the rulebook, and now I wait here patiently while the thing travels halfway around the world to reach me in Miami. While I wait I've been pouring over the PDF (the "low resolution" version is available immediately when you buy the book) and thinking about what to do with it. First off, even though The Coming Dark, Chapter One is 80% done for Pathfinder, I'm seriously considering converting it for 13th Age. The #1 reason for doing that is because it's so much easier; monsters don't have these huge, mathematically complex stat blocks. So I can focus more on the story and the environments instead of spending days on end tweaking the monsters in PCGen. I am practically convinced that I will make the switch, but I'm waiting until I receive the physical book to make my official decision. 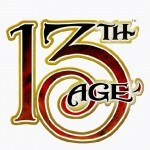 I've asked the guys that created 13th Age about licensing; if you've read this blog before, you know that is an important issue and a very touchy subject for me. Officially they're not licensing it out yet because the system is still in its infancy and they want to build up their own products before letting third parties do it. So, depending on whether I wait for licensing to become available or not, I might end up releasing it as simply "13th Age Compatible". I still need to figure out the legalities in that. I'm also considering flexing my software development muscles and creating either a character builder or a monster builder, but for this sort of thing I can't proceed until I get the publisher's blessing. So that may happen eventually... I just don't know if or when. In the meantime, if you haven't already I highly recommend that you at least try out a game. Aaron's running games online almost weekly, I think, so I'd recommend hitting him up on Twitter (@WolfSamurai). My hardcover's scheduled to arrive Wednesday. Barring legal limitations in doing so, I'm predicting I'll make the official switch then, so I expect I'll be talking a lot about it in the near future. Happy Post-April Fools Day everyone! Time for an explanation... On April 1st 2001, while I was actively developing The Opera, a total conversion for Half-Life, I launched an "Opera Pre-Alpha", which is actually still visible and downloadable HERE through the Internet Archive (amazing... the ZIP file is still there to download!). You can read the entire background there. Six months ago, amidst the news of "D&D Next", I made the choice to do it again and create another language interpreter using Dungeons and Dragons content. To be honest I had three choices of games I wanted to emulate: Zork, Wizardry (Proving Grounds of the Mad Overlord) or Ultima (III: Exodus or IV: Quest of the Avatar). 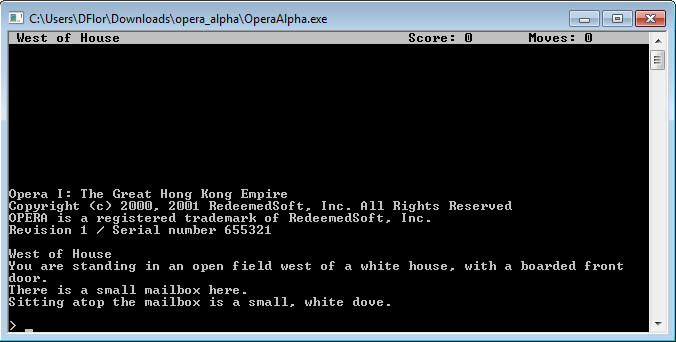 All things considered, Zork was the easiest to do. I did not have the benefit of having the source code to the original one I created 12 years ago (in C++, if you're wondering), so I set out to re-create the entire natural language interpreter in C#.Net. Yes, you read that correctly... I didn't use an existing interpreter like Z or Muddle; I created my own interpreter from scratch. The result was The Caverns of Mayhem: A Dungeons and Dragons Adventure! This was actually somewhat of a challenge to do. 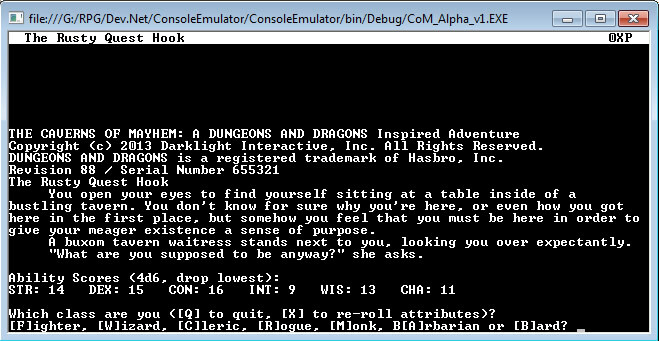 Not so much the language interpreter - I've done that at least three times before, each time in a different programming language - but how exactly to translate the D&D game mechanic to an interactive text adventure. I did the best I could, but there are certain things that are noticeably absent; for example, I didn't implement skills because I didn't quite know how. And the cleric's Channel Divinity powers were for the most part omitted because most of them were reactions which just wouldn't work. To "win" you have to battle your way to the treasure room, take the treasure and return to the tavern with it. There are goblins and a medusa in your way; everything else is just filler. As was the case with the first one I did in 2001 (read the write up linked above), there was a lot more that I was thinking about but just didn't have time to do. For example, I had much more interaction planned with the tavern staff, the orc and the gazebo. There are numerous responses taken verbatim from Zork, such as responses to suicide, jumping, yelling or typing "xyzzy" (or any other magic word from Sorcerer, Enchanter, Spellbreaker or Wishbringer for that matter). Use any one of George Carlin's seven dirty words. Use a Doom cheat code like "idkfa" or "iddqd". The response mimics what the game Hexen does if you try to enter a non-Hexen cheat code in to it. As a wizard, "cast magic missile" while in darkness. "Cast burning hands" (as a wizard) or "cast flames of the phoenix" (as a monk) in the presence of the gazebo. Sell the orc's pie in the tavern. Count the leaves. This is an inside joke in several Infocom titles. The number also has special mathematical significance: 69 in hexadecimal is 105 in decimal, and 69 in decimal is 105 in octal. I had other plans for the leaves, but just never got around to them. Search the refuse in the Refuse Room. Yes, I implemented dire rats that most people will never see. As a barbarian, you can "rage" or "flip out". Roll the dice and either get snake eyes (curse) or box cars (boon). Try to cast a spell while in the tavern. Besides myself, all the other names in the README are characters from films directed by Stanley Kubrick. Other things I don't remember. I worked on and off on it for the past two months, and it was kinda fun to do and I'm actually really proud of it. I wish I could do more, but there simply wasn't enough time. And it wasn't perfect; there was actually a crashing bug if you tried to eat the leaves (among other commands). I have since fixed that and uploaded the new version. If you are curious, below is a link to where you can download the complete source code in C#.Net to The Caverns of Mayhem: A Dungeons and Dragons Adventure! 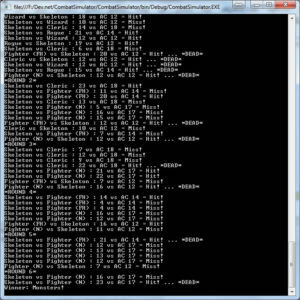 The project is compatible with Microsoft Visual Studio 2010 and only requires the Microsoft .NET Framework v2.0 to run. Since we are not authorized to be direct competitors to the upcoming MMORPG Neverwinter by Cryptic Studios, our product is a single player campaign that will be a traditional delve through a dungeon. While we have had a group of professional, well known writers working on the story - most of which you are familiar with, but we are not allowed to disclose names yet due to Non-Disclosure Agreements - I and a group of experienced software developers have been working on the engine. Since we do not want to take funding away from Wizards of the Coast and would rather they spend the resources they have to get "DnD Next" developed and released, in a few weeks we intend to launch a Kickstarter project to fund the development of the final product. We did not want to launch a Kickstarter before we had a "proof of concept", and unlike some other companies we do not want to launch a Kickstarter to fund said "proof of concept". So we have been developing the engine on our own, on our personal time and at our personal expense, in the hopes that it can show the world what we're capable of and more easily reach our goals once the Kickstarter launches. After further negotiations, and painstaking work over the past few months to get it in running condition, I have been authorized to release our first "proof of concept" (which we refer to internally as an "alpha" build) for The Caverns of Mayhem: A Dungeons and Dragons Adventure (tentative title... we'll let the writers come up with something better) that you can download below!!! The game engine is not exactly a direct port of the "DnD Next" ruleset simply because, as is the case in Neverwinter, a lot of the rules don't exactly port flawlessly from the tabletop to a video game. But it has everything you've come to love about D&D: it's got dungeons, it's got monsters, it's got treasure... and, heck, it's even got a dragon! The "proof of concept" which you can download below has been developed for Microsoft Windows (we're investigating a Mac port, but none of us actually own a Mac so we'll probably have to wait for funding on that) and requires nothing more than the .NET Framework 2.0. It is not graphics intensive so it should run on pretty much any machine; in fact, for those of you with inferior machines our game will probably run significantly better than Neverwinter because the hardware requirements are much lower. And, thanks to proprietary compression technology, it uses a lot less drive space! As we mention above, it is a very early "alpha" build and has some known issues. And, since it's an "alpha", I ask that you do not start reporting bugs in it; we pretty much know what most of them, and have tried to document them in the "readme" file included with the distribution. Please read that file prior to launching the game so you understand what to expect and are aware of the aspects of the game that have yet to be completed. We here at Darklight Interactive are entering an interesting time, and we would like to thank everyone at Wizards of the Coast for giving us the opportunity to use your license. We hope that, after looking at our proof of concept below, you support us and await our upcoming Kickstarter launch. Dungeons & Dragons, D&D, Neverwinter, Wizards of the Coast, and their respective logos are trademarks of Wizards of the Coast LLC in the U.S.A. and other countries, and are used with permission. Hasbro and its logo are trademarks of HASBRO, Inc. I've recently been working a bit on some tools I us to make my life easier, so I thought I'd share them. Both of the following apps are for Microsoft Windows and require the .NET Framework (as I write this I don't remember if it's 2.0 or 3.5). They are standalone EXEs that are fairly portable and have a small footprint. A while back I posted an offline 4E damage calculator that used formulas based on Sly Flouish's calculations. I modified the application to support adjustments due to ongoing damage and automatic percent increase for brutes (25%). 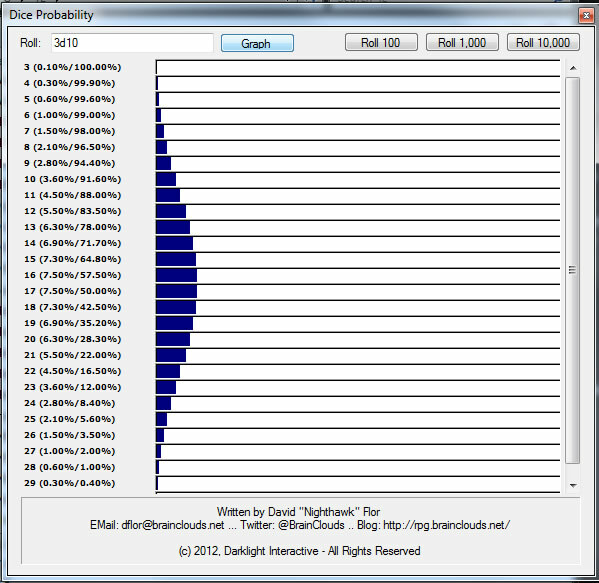 While kicking around ideas for an RPG I'm thinking of doing, I needed an easy way to visualize bell curves for dice pools of varying sizes and for multiple different dice combinations. Thanks to followers on Twitter I was directed to AnyDice.com, but I needed something a little more portable. The application shows you the distribution for any dice equation you put in, from the basic (3d10) to the complex (3d6 +1d8 +9). It will show you the mathematical probability but also has options to make 100, 1000 and 10000 die rolls to be a little more convincing. And there ya go... If you have any issues or requests with the above, please let me know. Unless I think of something else to make my life easier, my next application will most probably be a Monster Builder. The 4E one I was working on is actually farther along than I would have thought, so I might make that one available after all. Stay tuned!